A long while ago, we asked you to tell us about your personal nursing superheroes: the people who motivated and inspired you, or set an example you have tried to live by. This Thanksgiving, we’d like to share the story that perhaps moved us most of all. Thank you, Heather Wilson! “As a child, I never pondered the thought of what kind of career I wanted to have as an adult. I don’t recall anyone asking or prompting me to give my professional future much thought, at least not until I was in sixth grade. It was then that I was assigned to make a display board that reflected my future goals and dreams pertaining to what I wanted to be when I “grew up” and went to college for my career of choice. Though I had never given this much thought, I was surprised by how naturally and easily the answer came to me when I started brainstorming and considering the plethora of options I could choose from. I immediately thought of my Uncle Jack, who was and is still a Registered Nurse. I remember thinking about how caring he was and how, even though he didn’t know it at the time, he had impacted my life immensely. As a child without many positive male role models, my uncles filled those voids for me throughout my life. I absolutely thought of my Uncle Jack as a superhero because he was a nurse, and I was quite fascinated by the thought of him taking care of the sick and helping to save lives. He was kind. He was very giving. He was everything that anyone should be. My career choice was made almost instantly; I wanted to be just like my Uncle Jack, my idol and role model. I wanted to become an RN. I reached out to my Uncle Jack to help me with this project, and he was very informative and helpful, which was just true to his nature and who he was as a person. He sent me materials for my display board, and one of the items included a pamphlet about his employer, St. Joseph’s, now St. Joseph’s/Candler Hospital in Savannah, Georgia. I remember being so proud because his picture was in the publication, and he was shown with his stethoscope listening to a child’s heart. 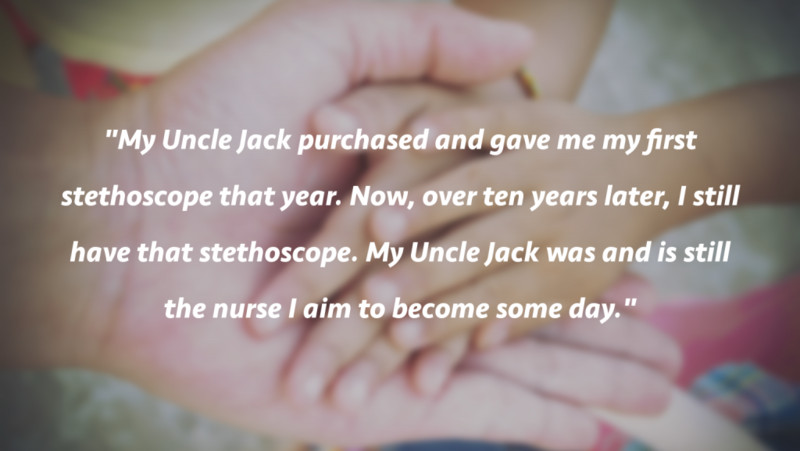 Uncle Jack told me how proud he was that I wanted to be a nurse, and he advised me to start my career by first becoming a CNA and working my way up so that I could attain a good understanding of all the aspects of patient care. He also went into great detail about his passion for nursing and how helping others had been one of the greatest joys and honors of his life. He advised me to always be a nurse who put her patients first, no matter how big or small the need, whether doing so required reassuring and calming someone’s fears, or being as knowledgeable as possible to help my patients understand their diagnosis/diagnoses, and by extension having the ability to educate their families. Years later, I was accepted into the nursing program to become a Licensed Practical Nurse at a local technical college. My Uncle Jack purchased and gave me my first stethoscope that year. Now, over ten years later, I still have that stethoscope. My Uncle Jack was and is still the nurse I aim to become some day as I now work toward attaining my RN. My Uncle Jack is not only caring, professional, compassionate and successful, but he is still pursuing his own education. He has faced some challenges and had to contend with health issues, but he has not let what could dull his shine stop him. He pursues his goals and aspirations with gusto, and he is an encourager. He encourages me. He encourages my children. Uncle Jack pushes everyone to be the best they can be. He shares his knowledge and wants to be part of the betterment of the nursing field for all nurses. He was part of a movement which petitioned the state capitol to implement The Patient Bill of Rights. For that alone, I feel I owe him a huge debt of gratitude. My uncle, my idol, my role model and mentor has a reputation the precedes him. I have worked with nurses who have worked with him, and I have heard each say how brilliant he is and how wonderful his bedside manner as a nurse is. It has been a joy to hear stories from my nursing counterparts about working alongside him or under him in supervisory positions he has held. Read more stories about your nursing superheroes!